They say every youth hostel is a different experience. I was felt pretty tired and after an evening stroll I arrived back at the hostel around 10pm really wanting to hit the hay. However the small, cosy nature of a room of three meant that just wasn’t going to happen and I ended up sitting on the sole chair trying to make polite conversation as my two room mates wittered on to each other. When I was planning the trip, I’d wondered how I’d get on with just myself for company. It was something I was worried about. Yet here I was, having the opportunity to engage in intelligent conversation and actually wishing I was alone so I could get some sleep! I had to wait until the next morning to get some peace, as I headed out towards the hills in the rain. After two glorious days, the Lake District’s famously temperamental weather had done a u-turn and I was back in the waterproofs, walking along empty paths. I only saw one person that morning as I ascended up Lonscale Fell – a cyclist heading back down towards town. But whilst it was wet, the rain was hitting me from behind, and not too heavy at that. 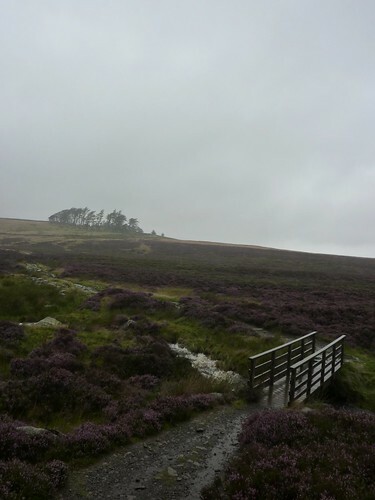 I could at least walk on, take photographs and enjoy the cloud filled views as I wound my way along narrow and rocky paths, admiring the purple blooming heather in the gloom. When walking long distances I find it’s useful to set yourself milestones to help you check your progress. 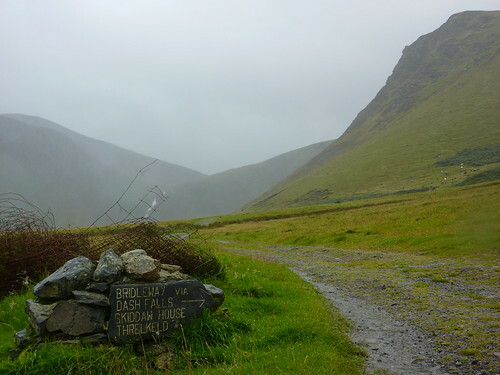 My first for the day was Skiddaw House – the highest youth hostel in Britain (472m above sea level) and perhaps one of the most remote. It has no road access, and can only be accessed by foot or by cycle. It was originally build as a game keepers lodge around 1829, and later also used by shepherds. No longer needed in the 1970s it fell into decline, but work began in 1986 to convert it into a hostel, and once converted, it was handed over to the YHA to operate. It had recently re-opened after a period of closure caused by disagreements with the lessee. My reason for visiting was not a social call however. The one thing I was really looking for was not the hostel itself, but something at the side of its building. Marked on the OS map was a shelter and it was there I retired to get out of the rain and have an early lunch – 11:30 may be a bit early for a cheese butty, but I knew this would be one of the few places I could definitely stop and rest. 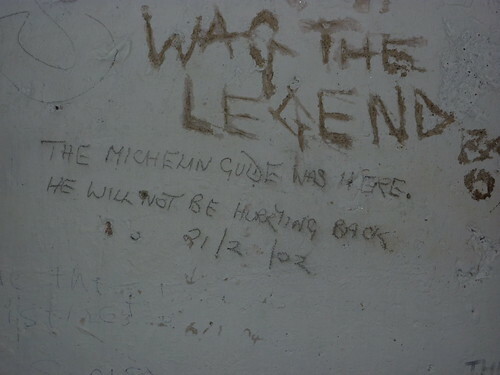 And admire the witty graffiti scrawled on the wall. After lunch it was decision time. At this point the Cumbria Way splits in two. 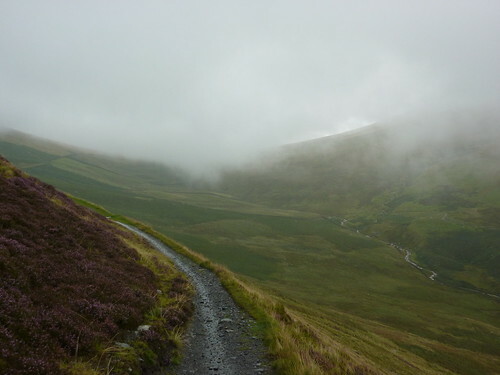 I could take the east route up over Caldbeck Fells, but my guidebook warned me that in bad weather this was not a sensible idea. Instead I opted for the lower level Western route – two and a half miles longer, but at least suitable for the weather I was having to put up with. I’d done 5 miles, but now had eleven and a half to go. Once down from the wet and windswept moorland, it was to be an afternoon spent mostly getting lost on farmland. For just when you needed them most, the helpful footpath signs disappeared and footpaths strangely disappeared. I spent a memorable time scrambling along a steep, muddy bank above a stream desperately trying to find the promised footbridge over it. This was then followed by the steepest bridleway you’re ever likely to see in your life – which was, naturally, covered in very wet, slippery mud. To say by this point I was in a joyous mood once more, but was calmed by the fact that the rain had ceased. Until it started again. And so began a pattern that became familiar for the afternoon. Just as I thought I would arrive at my B&B reasonably dry, the heavens would open again. 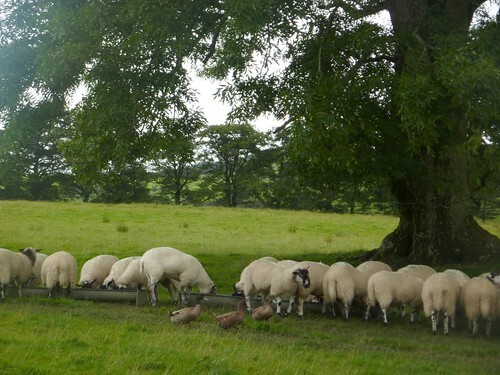 My mood wasn’t helped by the view – dreary clouds, sheep and stiles out of fields that were inevitably mud baths. The look on the B&B landlady’s face as I stood dripping on her doorstep in Caldbeck was one to remember, as a wild, wet and unkempt looking man turned up on her doorstep, babbling away at a hundred words a minute. During the afternoon the only people I’d spoken to were some farmers, and myself as I ranted and waved my fist in the area following my boot ending up in yet another deep puddle of mud. Her offer of putting my damp clothes in the tumble dryer was gratefully accepted, before I set off to defile the clean and neat bathroom with my muddy presence. Normally I’d mark somewhere down for a lack of a shower, but for once a bath really did hit the spot as I soaked the cares away. 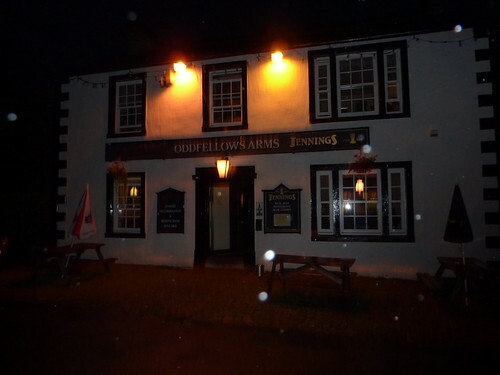 That done there was little more to do than pop to the pub – The Oddfellows Arms, where I had the most fantastic Lamb Jennings washed down with some Jennings Cumberland Ale. This proved to be the perfect accompaniment to an evening in the pub reading The Lord of the Rings, which I’d chosen as my “holiday book” mostly on the basis of it being reasonably long and I would have happily stayed far longer had it not been for the fact that I was feeling rather on the tired side. Reluctantly I headed off back into the rain and to bed. Some of these photos really are stunning! First Published: 22 September 2009. Last Updated: 16 November 2014.